Montauk Seafood Grill in Vail underwent a renovation before the start of this ski season. The restaurant has been a staple seafood spot for three decades. The tides have changed in Vail this season as Montauk Seafood Grill rolls into winter with a new owner, an invigorated space and revitalized menu. 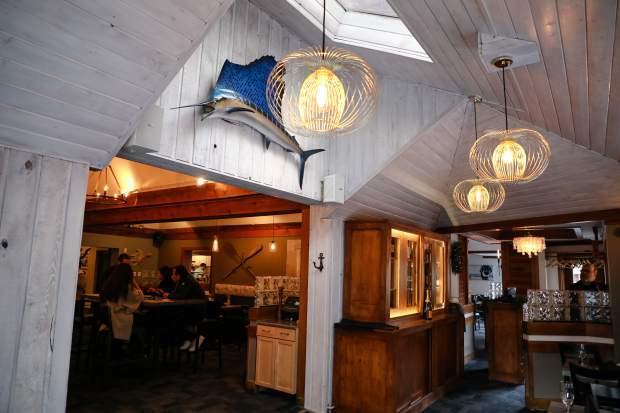 Cameron Douglas purchased the restaurant in October, and after a three week renovation process, Montauk reopened in early November in its longtime home of Lionshead Village. The restaurant has been a staple seafood spot for three decades. Douglas gave the space the facelift it needed, with fresh paints, all new lights, new art and furniture. Darker wood panels were white washed to brighten up the dining room, with fun nautical additions, including a few jelly fish-style overhead lights. The menu still offers some of Montauk’s classic, such as the calamari and the lobster mac and cheese, but a lot of new additions have been incorporated. Veteran Vail chef Dimitri Souvorin was part-owner of Montauk for years, and he’s back as executive chef to the delight of many. The menu is no longer presented like a book you need to flip through, but is now a square sheet with all your options on the front and back side. New appetizers such as the Montacos feature a ponzu dressed yellowfin tuna crudo, wasabi aioli, fresh avocado and salmon caviar. Another fresh addition are the lobster roll sliders with Maine lobster salad, lemon aioli, bib lettuce and tomatoes on a mini toasted slider roll. Bistro-style salads and soups are available, such as a classic Caesar or New England fish chowder, along with more innovative dishes such as the charred Spanish octopus salad, served with roasted peppers, oranges, garbanzo beans, arugula, olives and blood orange vinaigrette, topped with marinated and charred octopus. Entrees on the menu include dishes such as Maine sea scallops with udon noodles, edamame, Thai chiles, Shiitake mushrooms and baby boy choy, as well as Montauk signatures like the Hawaiian ahi seared rare, served with a crispy vegetable and Louisiana rock shrimp stir fry, sesame sushi rice, soy ginger vinaigrette, pickled ginger and wasabi. Montauk’s raw bar is the place to get a selection of fresh oysters and more from both of the country’s coasts. The kitchen gets its fish and seafood from Seattle Fish Co., a wholesaler based in Denver. Many “land” options are available as well, including short ribs and filet mignon. Add “surf to your turf” with any of the plates, such as a four-ounce lobster tail or Alaskan king crab legs. All of the main dishes can be ordered “naked” — simply grilled and seasoned fish or meat with a choice of two sides. Drink selections include beer and a well-balanced wine list, along with classic cocktails given a unique twist. Try the Filthy Martini for a taste of ocean-like brine, or for a bourbon creation, the Old Man And The Sea is made with toasted pecan-infused Old Forester bourbon, black walnut bitters and a sugar cube. “Classic cocktails are our best sellers, and we just elaborated on them a little bit,” Douglas said. Keeping with the inspiration of a fresh twist on a classic, Douglas has maintained the well-established appeal of Montauk while giving it new life. He said it was the 14 years of mentorship from John Shipp, of Roadhouse Hospitality, that has made the transition into ownership a smooth experience.